PM calls on IAEA to inspect all secret Iranian nuclear sites revealed by Israel after agency head says it has inspected all it needs to. Prime Minister Binyamin Netanyahu reiterated his call for the International Atomic Energy Agency (IAEA) to inspect the secret Iranian atomic warehouse he revealed in a speech at the UN last week. Earlier, IAEA Director-General Yukiya Amano rejected the possibility of inspecting the facility. On Tuesday, Amano released a statement dismissing Netanyahu’s concerns, in which he asserted that the IAEA has checked “all the sites and locations in Iran which it needed to visit,” and that the IAEA "does not take any information at face value." “The Agency uses all safeguards relevant information available to it but it does not take any information at face value. In line with established safeguards practices, all information obtained, including from third parties, is subject to rigorous review and assessed together with other available information to arrive at an independent assessment based on the Agency’s own expertise,” Amano said. The Prime Minister's Office said in response to Amano's statement: "The IAEA relates to inspections that it has carried out in various places in Iran but it does not relate to the specific site in Turquzabad which Prime Minister Netanyahu referred to in his UN speech. There is no reason to wait. The IAEA must inspect the site and immediately dispatch monitors with Geiger counters and the Prime Minister's words will be seen as verifiable true." 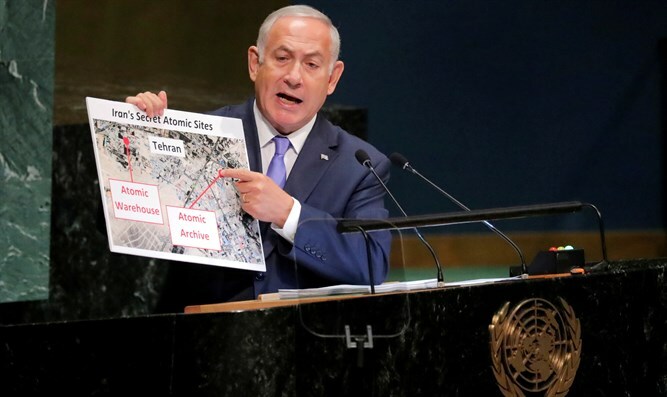 Speaking at the the UN General Assembly last week, Netanyahu was critical of IAEA’s failure to take action after his disclosure of the existence of an Iranian secret nuclear archive. "Months have passed. The IAEA has still not taken any action. It has not posed a single question to Iran. It has not demanded to inspect a single new site discovered in that secret archive," Netanyahu said. “In May, we exposed the site of Iran’s secret atomic archive, right here, in the Shorabad District of Tehran. Today I’m revealing the site of a second facility — Iran’s secret atomic warehouse. It’s right here, in the Turquzabad District of Tehran, just there, miles away,” Netanyahu said, referring to a map of Tehran. “Go inspect this atomic warehouse, immediately, before the Iranians finish clearing it out,” he said.